You are currently browsing articles tagged American Revolution. So it was thought by the pulpiteers of the late nineteenth century, and thus our title today. This description fit the Rev. Ethan Osborn, one of the early pastors of the Fairfield Presbyterian Church, located in Fairton, New Jersey, and organized in 1680. Born in Litchfield, Connecticut in 1758, Ethan Osborn was born to Christian parents and given a Christian education, taking his place as one in a family of nine children. When the Sabbath came as the first day in each week, young Ethan was in public worship. Like many covenant children, he attended simply out of obedience to his parents. But as the boy became older, the Sabbath became a most welcome day. He began to practice secret prayer and by the time he entered college, he had received the Savior by grace, through faith alone. College for Ethan was Dartmouth, beginning there at the age of seventeen. The American Revolution was at full tilt during his college years so that in the middle of it, he became a soldier at age eighteen. It was a very hard year for the young enlistee as the Continental Army was being pushed around all over the eastern seaboard in 1776. Ethan clearly saw the providence of the Lord in that, becoming sick one month, he was caused to miss a battle in which his regiment was captured with the result that only four of those captured made it through the brutal imprisonment. He returned to collegiate life soon after the war, graduating in 1784. Even though he would retire when he turned eighty-six years of age, he continued his ministry, preaching once when he was ninety-seven years of age. He went to be with his Lord in 1858 at age ninety-nine years, eight months, and ten days. The church today is affiliated with the Presbyterian Church in America, and is the oldest Presbyterian church of that denomination. 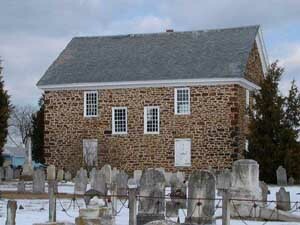 At right, the old former building of the continuing PCA congregation, Fairton, NJ. Of Ethan Osborn, it was said that he was THE pastor of the Old Stone Church, a church which had been established so early in this land, well before our American Revolution. And while we might marvel at old buildings and the echoes of the past, what is more remarkable still is a continued faithful adherence to the gospel by the pastors, faithful elders, and families that have made up this congregation for now three centuries and more. All praise and glory to our Lord and God who preserves His people in righteousness, for His sake. We are more apt to recognize the New Jersey delegates like the Rev. John Witherspoon, or maybe Richard Stockton, as signers of the Declaration of Independence. But joining them was one Abraham Clark. Born February 15, 1726 in Elizabethtown, New Jersey, his family was solid Presbyterians in their denominational affiliation. Baptized as an infant by the Rev. Jonathan Dickinson, first professor of the College of New Jersey, he grew up in the thrilling but dangerous days of increasing agitation of separation from England. With his inclination to study civil law and mathematics, he became known to his neighbors. Popular as “the poor man’s counselor,” he refused to accept any pay for his helpfulness to his neighbors. He further served them as High Sheriff of Essex County. He knew full well the cost of liberty. To a friend serving as an officer in the Jersey contingent of troops, “this seems now to be a trying season, but that indulgent Father who has hitherto preserved us will I trust appear for our help and prevent our being crushed. If otherwise, his will be done.” There is no doubt with convictions like this that he saw himself and his country safely within the sovereign providence of God. His two sons were captured by the British and put into the prison hold of a notorious prison ship called “Jersey.” Fellow prisoners fed one of the sons by squeezing food through a key hole. Abraham Clark did not wish to make his personal suffering public, so he told no one about his family stress. When they found out about it from other sources, the American authorities contacted the British and told them that as they were treating prisoner of war Clark, so they were going to retaliate against a British officers in captivity. Only then did the brutal treatment of Clark’s sons ease up. Abraham Clark was recognized as the member of Congress who moved that a chaplain be appointed for the Congress of the United States. And ever since then, a chaplain has been elected for that spiritual position. But there were religious responsibilities which Abraham Clark also kept. From October 26, 1786 to 1790, Abraham Clark was a trustee for the Elizabethtown Presbyterian Church of which Pastor Caldwell was the minister. Abraham Clark died in his sixty-ninth year on September 15, 1794. There can be no doubt that Robert Baird has both the gift of administration as well as the gift of teaching. Born on October 6, 1798 near Uniontown, Pennsylvania, in Fayette County, Robert went first to nearby Jefferson College in Washington, Pennsylvania. Graduating from that undergraduate college with high honors, he then studied theology at Princeton Theological Seminary. His senior year at the seminary also saw him at the College of New Jersey, serving as a tutor. After graduation from the seminary, he stayed in the area, serving at the pre-college school known as Princeton Academy, for six years. Licensed and ordained by the Presbyterian of New Brunswick in 1822 and 1828 respectively, he took the first of a series of mission agencies engaged in ministry to the masses. For seven years, he served at a General Agent of the New Jersey Missionary Society. 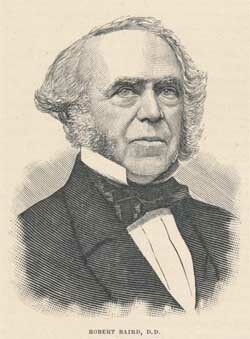 Following that, he became the General Agent of the American Sunday School Union for six years, seeking to organize Sunday Schools in destitute areas of our country. This ministry continues to exist today under another name. In 1835, Rev. Baird traveled all through Europe to promote evangelical religion on the Continent of Europe. He turned the latter into speaking engagements in America, as well as the authoring of six books on religion in the old country. At that time, those who had emigrated to America before the American Revolution were only one or two generations removed from the old countries from which they had come. And since many of them had come to America because of persecution of their faith, they had a great interest of what had become of their old lands and people. Robert Baird died in the middle of the Civil War, on March 15, 1863. Words to live by: In a number of our Presbyterian circles today, we would say that Rev. Robert Baird was laboring “out-of-bounds.” That is, his ministries did not fit the usual rule of laboring in ministries organized and overseen directly by the Presbyterian assembly, synods, or presbyteries. But that doesn’t mean these ministries were not effective instruments for the gospel in their own right. They were similar to the “para-church” ministries of our day and age. Both then and now, such ministries can be effective works for the Lord in areas where the Church either has not yet been organized, or, in some cases, where the Church, as the Church, cannot minister. As long as there is a priority of financial and prayer support to denominational approved agencies, it can be legitimate to also support a well-selected para-church ministry. Just make sure that they have a doctrinal statement which is biblical, and an outreach ministry which does what it claims to do, with no more than ten or fifteen per cent reserved for operating expenses. It must be transparent, with nothing to hide from Christian inspection. That need of accountability is one of core reasons the Presbyterian system works as well as it does. If you are reading this July 4, 2015 post as an ordained minister, you can simply turn to Loraine Boettner’s book “The Reformed Doctrine of Predestination,” Chapter 28, Section 7, on page 383 for what I am about to write. Don’t have the book in your pastoral library! Go out and buy the book immediately, and let the following quotations be a incentive to do so. Or if you are reading this national holiday post as a member in a Presbyterian church, borrow the book by Boettner on “The Reformed Doctrine of Predestination” from your pastor, turn to Chapter 28, Section 7 entitled “Calvinism in America,” and read the rich history of the beginning of your country which past and current school books have left out of the beginnings of our country. Then go out and buy one for your home and office! The Reformer theologian Loraine Boettner writes “It is estimated that of the three million Americans at the time of the American Revolution, nine hundred thousand were Scotch or Scotch-Irish origin,” or Presbyterians. How many of our readers were instructed with these truths in their schooling in either the public school or colleges and universities when they studied American History? I dare say not many would assent to the question. But it is time that we re-study the question, and rejoice in God-glorifying Presbyterian elders and people who sought at the expense of their own lives and liberties to proclaim liberty throughout the land. Let us be knowledgeable descendants of them this Happy “Presbyterian Rebellion” Day, July 4, 2015. Our post today comes courtesy of guest author Dr. David W. Hall, pastor of the Midway Presbyterian Church in Powder Springs, Georgia. Dr. Hall’s article originally appeared in the year 2000 in the online webzine PREMISE. While certainly Adams was no Presbyterian, the subject here has obvious relevance as our nation celebrates its independence tomorrow on the 4th of July. Adams would later refer to himself as a “church going animal.” By any estimation one of the most important figures for the founding of America, Adams, nevertheless, did not identify himself as a Calvinist. Toward the end of his life, he championed anti-Trinitarian legislation, and bitterly reviled Calvinists, on occasion, as “snarling, biting” divines. However, the impress of Calvin was so deep on Adams’ predecessors that a certain Genevan fingerprint is indelibly inked on Adams’ writings. Adams believed that knowledge in general could dispel “arbitrary government and every kind of oppression.” In his 1765 Dissertation on the Canon and the Feudal Law, he recognized lust for power as the root of slavery. This yearning for dominion was both the cause of much oppression and the effect of human depravity. Adams, his Calvinistic heritage showing even if perhaps not intended, was severe in his criticisms of Roman Catholicism. His anti-Romanism, which far exceeded that of most modern Calvinists, is seen in his widely disseminated Dissertation. In it, he spoke of the Mass as producing a “state of sordid ignorance” and leading adherents to a “religious horror” of knowledge. Elsewhere, Adams castigated episcopal government as a “ridiculous fancy of sanctified effluvia.” Moreover, he referred to the Catholic impulse as an aspect of the Antichrist and alleged that a “wicked confederacy” of tyrannical views of church and state emanated from Catholicism. In terms that were introduced by earlier Calvinists (but disavowed by later ones), Adams further excoriated that confederacy as inhibiting liberty and knowledge. Such “darkness” (or the “monkery of priests” he later called it) only ended, according to Adams, when God’s “benign providence raised up the champions who began and conducted the Reformation.” So, while not a card-carrying Calvinist, Adams at least appreciated their political contribution. Most Calvinists today view his fiery denunciations of religious hierarchicalism as an overreaction. Adams credited the Puritans with conspiring to “use every measure and take every precaution in their power to propagate and perpetuate knowledge.” It was the Puritan Calvinists whom Adam thanked for laying the foundations of colleges and requiring that each town provide a grammar school. Tinged with regional pride, Adams boasted of the Puritan impulse supporting education. Colleges were obligated, in his view, to spread this knowledge which would aid all of society. As it came time to defend the Declaration of Independence, this New England “Atlas of Independence” did not consider secular forces alone, but wrote that the causes of the Declaration were justified “in the sight of God and man.” Adams wrote his wife on July 3, 1776, predicting, “It is the will of heaven that the two countries should be sundered forever.” If not, he feared earning the frown of Providence, suggesting that “solemn acts of devotion to God Almighty” be rendered in worship services in the future. His explanation for the cause of the American Revolution is worth hearing. Adams believed that the important revolution occurred “before the war commenced.” It was, he said, “the Revolution in the minds and hearts of the people; a change in their religious sentiments of their duties and obligations.” What he referred to was that American Christians no longer recognized a hereditary claim to their obedience regardless of the behavior of rulers. Romans 13 was not interpreted unconditionally any longer, and “when they saw those powers renouncing all the principles of authority” and trending toward tyranny, Americans enshrined the Reformation mottoes that resistance to tyrants was a religious and civic duty. That “radical change in the principles, opinions, sentiments, and affections” of Americans, said Adams, “was the real American Revolution,” long before the first musket was fired. After the Revolution, his role in drafting the Massachusetts constitution (1780) may indicate much about his views. An earlier 1778 attempt to establish religion had failed when Massachusetts representatives, including Adams, sought to tie holding civil office to Protestantism. Following that defeat, Adams and others drafted more tolerant language. Although some Massachusetts leaders in 1780 still desired a Geneva-like establishment of Protestantism, others were moving away from that view which had been practiced in Massachusetts since its founding. Adams was even so sure that the Congregationalists would not be satisfied short of an establishment of generic Protestantism that he sooner expected alteration of the celestial bodies in the solar system. In that context, a few years after the Declaration of Independence, his role in framing the Massachusetts Constitution is worth reviewing. That chapter of Adams’ public life indicates that he was far from secular Deism at the founding of America. Adams’ first drafts included references to worship as a universal duty, and God was cast as “Supreme Being, the great Creator and preserver of the Universe.” Adams even drafted a provision (which was rejected) stipulating that no one could serve in the state House of Representatives unless a Christian. In the same document, Adams also approved of an oath, affirming belief in and profession of “the Christian religion and . . . a firm persuasion of its truth.” Moreover, the original Massachusetts Constitution also included an explicit rejection of foreign Prelates. By 1821, this religious test was removed from the state constitution (Adams never countenanced a national establishment of religion. ), and religion was disestablished in Massachusetts by 1833. However, the fact that these amendments occurred a half century after the Revolution gives pause to any who claim an exclusively secular ethos for that day. Adams even thought in 1779 that the “only true foundation of morality” involved “the knowledge and belief of the Being of God, His providential government of the world, and of a future state of rewards and punishment,” and that the state had a moral duty to provide or support public worship. Hardly an iron curtain of separation! Such a plan was not new; from its inception Massachusetts embraced a model much like Geneva’s, complete with parishes that were established under the authority of the town council. Tithing and taxation supported the church at Massachusetts’ founding. From 1692 until 1780, each of the almost 300 townships were to have tax-funded congregationalist/Protestant ministers. · Public worship and religious instruction were the means of inculcating these essential substrata. · Each town was responsible to elect its own teachers of religion, who were supported by public monies. Even though this proposal from Adams did not succeed in the end, it, along with other references in the 1780 Massachusetts Constitution, made it clear that religion was permitted to have a large role in early American society. Religion, at least for Adams and most other founding fathers, was not an awkward stepchild sequestered only in remote basements, if permitted at all. Indeed, the religious oath, committing a civil official to “the christian religion and . . . a firm persuasion of its truth,” did survive the 1780 ratification, indicating at least that a super-majority of Massachusetts citizens after the Declaration of Independence still preserved much of their Puritan or Genevan heritage. In addition, continued support of Harvard College was specified in this same constitution, along with the notation that education “tends to the honor of God, the advantage of the christian religion, and the great benefit of this and other” states. John Witte comments that such proposals neither fostered much controversy at the time, nor have since been repealed. Some historians speculate that Adams was willing to assume “the posture of a Puritan magistrate” to call the nation back to their covenantal obligations. In a fast proclamation in 1798, Adams urged the nation to repent, referenced the third person of the Trinity, and called for “reformation.” The next spring, President Adams called for another fast, this time commissioning Presbyterian Ashbel Green (who played a major role in the founding of Princeton Seminary and also edited John Witherspoon’s Works), a congressional chaplain and former student of Witherspoon, to call the nation to repentance. In that address, references were made to the following theological doctrines, which if not sectarian can only reflect the consensus of the public of the day: the inspiration of Scripture, the “governing providence” of God, the omniscience of this God, the justice of God in meting rewards and punishments, and the accountability of humans to God. Later in life, Adams may have strayed toward Deism. By 1815, he recognized a chasm between philosophical options. The great “question before the human race,” he thought, was whether to pattern life and government after a purely natural approach or to conform to religion and miracle. He believed in a future reward but not eternal punishment. Even late in life, he recognized the “fixed principle” among the founders of America, dating back to 1620, as “independence of Church and Parliament.” While John Calvin could well have endorsed and practiced that slogan indicating a proper separation of jurisdictions, Americans at the founding differed significantly in their development of this crucial intersection. Adams, thus, was not a Calvinist, but neither could he escape the influence of Genevan models 250 years after Calvin. If the Swiss Reformer’s imprint was this longstanding with Adams, not to mention a large majority of New Englanders, then surely its impact on the founding period of America is larger than what most Americans have been taught for much of the twentieth century. To Presbyterians, the American Revolution had been a holy war. And now with its winning, Christian Presbyterians could get back to growing the church. And that growth took place in a period of spiritual progress. From New York all the way south to the Carolinas, new settlements were begun, with Presbyterian missionaries and ministers being sent throughout the whole length of the land. But as the churches and the presbyters became more and more distant from one another, there was a concern about attendance. In all the synods put together, over one hundred ministers were absent in any given year with only six of the churches presented by elders. In one synod, a new moderator was elected, and then excused when it became known that he had not been present for the previous eleven years. Clearly something had to be done. The sixteen Presbyteries were organized into four separate synods in 1785. They were: Philadelphia, New York and New Jersey, Virginia, and the Carolinas. Numerically, this meant that there were four synods, sixteen presbyteries, 177 ministers, 111 licentiates, and 419 churches. It was on May 21, 1789, that the first General Assembly was held in the original city of Presbyterianism, Philadelphia. John Witherspoon was chosen to preach the first sermon of that assembly. The delegates chose the Rev. John Rodgers to be the first moderator. He had been trained back in the Faggs Manor Presbyterian Church under New Side Minister Samuel Blair. Some housekeeping had to be done in light of the separation from England. No longer could the civil magistrate be considered to be the head of the church. So chapters in the Westminster Standards which put him as the head of the church were re-written in the light of the American victory in the American Revolution. No one denomination would any longer be considered a state church, whether it was Anglican, Roman Catholic, or Presbyterian. There was a separation of church from state. We may never know whether Fosdick chose that specific date for the delivery of his infamous sermon, whether he intended with some note of irony, but clearly that sermon serves as a marker for all the many changes that have come since. As it is true for denominations and for local churches, so too every Christian is each day faced with decisions that may steer us in one direction or another. A decision to follow Christ or to follow self and its desires, which will it be? But his delight is in the law of the Lord and in His law doth he meditate.”—Psalm 1:1-2, KJV. There are two phases of the church which are understood in the Biblical record. One of them is the triumphant church, which are God’s people in heaven. The other is the militant church, which are God’s people in constant combat with the forces of wickedness on this earth. Primarily, that militancy is a spiritual one, but occasionally the militant church has to do battle in the physical realm. October 10, 1774 was one of those times. We have already looked at the beginning stage of this great battle between the Virginia militia and the Indians of Point Pleasant. That occurred on September 11, 1774, just about one month prior to this event. (See entry) Here today is an account of the conclusion of their forced march through the wilderness. Remember, most of the eleven hundred Virginia militia, led by General Andrew Lewis, were members of the Presbyterian churches of Hanover Presbytery. Arriving near present day Point Pleasant, West Virginia, the battle began with an attack by the Shawnee chief Cornstalk, with three hundred to five hundred and possibly even up to one thousand braves behind him. In fact, there were a series of skirmishes in the all day battle, some of which were hand to hand in nature. It was one of the most vicious battles which the Virginia backwoodsmen up to that point of their existence had to wage. About one fifth of General Lewis’s men were killed and wounded, which translated out to 75 soldiers killed and 140 wounded. Judging the Indians injuries is difficult, but estimates range from a handful all the way up to two hundred and thirty casualties. When militia reserves came in around midnight, the Indians fled across the Ohio River. It was at a later date that the native Americans signed a treaty which opened up present day Kentucky and Tennessee. It also opened up both of those future states to the gospel in general, and in particular to the establishment of Presbyterian churches. When they returned to Virginia, they discovered that the two battles of Lexington and Concord had already been fought up in Massachusetts. The American Revolution had started. Yet, because of all the future battles of that War of independence, this battle has been forgotten by historians. Yet this was the leading battle of the American War of Independence, and Presbyterian members had a pivotal part in it. Words to live by: On occasion, there may be cause to actually take up arms and fight for your lives. This was one such occasion. With continual attacks upon settlements and meeting houses, it was either the Presbyterian inhabitants returning back to the sea-coast towns, where there was more security, or staying put and fighting for their faith, their families, and their churches. Certainly Samuel Davies, of the Hanover Presbytery, would preach many a war sermon to encourage the defense of both the faith and their lives from marauding Indians. And Presbyterian settlers took their life in their hands along with their sacred honor, and stood their ground and rallied on this occasion. Certainly the cultural mandate demands that we take our stand on biblical principles and against those who would seek to destroy that principles. Are you praying, and working, in at least one area of this cultural mandate? There can be no doubt that Robert Baird had both the gift of administration as well as the gift of teaching. Words to live by: It was said that Abraham Clark was a Christian, a family man, a patriot, a public servant, and a gentleman. That about covers the sphere of influence which all Christians are to serve both God, the church, and our country. Once, he was offered freedom for his sons from their British captivity if . . . if he turned colors and became a Tory, or become loyal to England. He responded “no.” He was convinced, as he said to a friend in a letter in 1776, “Our fate is in the hands of an Almighty God to whom I can with pleasure confide my own. He can save us or destroy us. His counsels are fixed and cannot be disappointed and all his designs will be accomplished.” Amen, and Praise God!